Many spyware have passed through our lab. We have written many reviews and advised how to find, delete or protect yourselves from these programs. Almost all of them are able to do screenshots or record videos. Besides this, they also have other functionality. Test using various antivirus and antispyware shows that some classic tools define such programs as a threat to the user. However, if the spying on user limited by screenshotting only, antiviruses do not consider it as a threat. Such behavior is explainable – taking screenshots is a common feature, and you can find it in many popular programs. Even Windows takes screenshots with a single keystroke. Therefore, antivirus programs do not react on such action. Consequently, they do not protect against it. Commands in BAT file (which runs in Windows command prompt) can start screenshoter. The commands can run from the DLL to make screen shots at certain intervals. After these actions, these programs will be unloaded from memory and you will not be able to find them in any processes. There are many options and classical methods of protection do not prevent these actions and does not show the presence of a secret surveillance. A typical representative of screenshotters is Hide Trace, which monitors user’s actions, creating a detailed report about open windows by making screenshots. We have installed this software on computers with different antiviruses and anti-spyware, and scanned the operating system. None of them detected it and none forbids taking screenshots. Moreover, we conducted online testing of Ht.exe using 39 popular antivirus programs and none of them considered this file as a threat. How to protect your information from screenshoter if usual methods are not working? COVERT hides all user actions in its secure environment from any screenshoter. Just press one button with the program’s logo and the inscription “Login to the platform protection”, and you should not worry about possible surveillance. COVERT does not scan your operating system for spyware. This is not necessary. You can check the effectiveness of the protection even in the demo version. Install any software that can take pictures on the timer. Enter the secure platform, launch “Notepad” and start typing. After some time, click “Exit” and look at the captured images or video in the installed program. You will see that it could not take a screenshot with the text you typed. Therefore, no matter what kind of screenshoter was installed on your computer. If you work within a secure environment, no one can get the information you are working with. 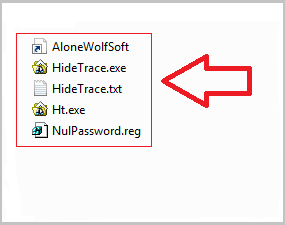 In our test Hide Trace was unable to get data about windows which was open within COVERT. All of its screenshots had no information about the work in the secure platform. 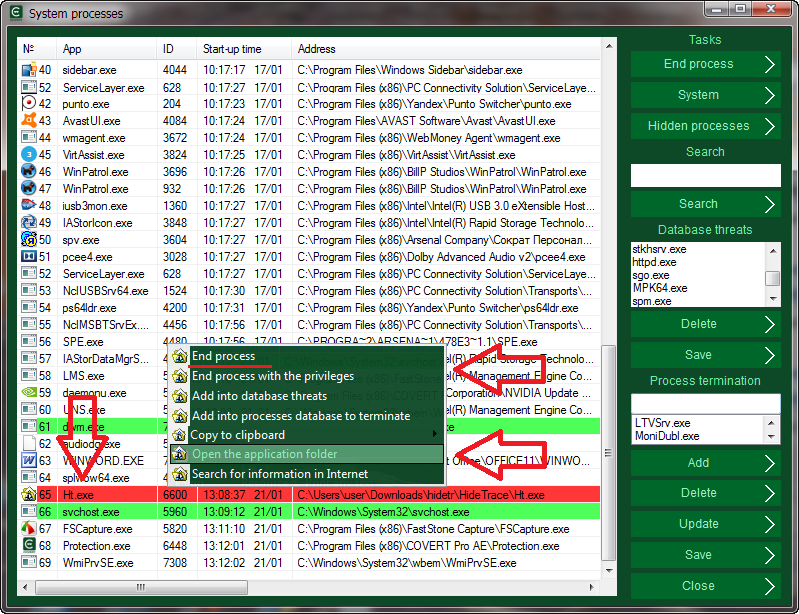 To remove screenshoter Hide Trace you should open system processes, right-click on the line with the process Ht.exe. In the context menu select “Open the application folder“, then choose “End process“. Delete the folder and its contents.